Where are the polar bears? Polar bears, as we all know are one of the most admired animals on earth. These animals are put in zoos for our entertainment, but now they are in need of us. 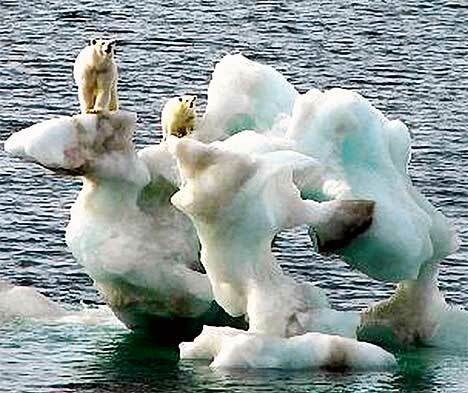 The polar ice caps in which they walk on are melting, and if we don’t do anything about it they will be extinct. There are stories in magazines, newspapers, books, and etc, about polar bears that drown, hungry, homeless, and dying. We must do something about it, or they will be all gone. We all know about the extinction of the dinosaurs. They were completely wiped out from the earth, because of the asteroids. Stated in a book, 50 to 70 percent of the animals were wiped out from the earth when the asteroids hit. We don’t want the polar bears to be extinct also, I mean wouldn’t it be awkward, digging out the bones of polar bear and placing them in the museum? The main reason why the ice is melting is because of global warming. Before we can save the polar bears we have to find a way to stop global warming. We can stop global warming by lessening the use of hot water ant turning off devices that use heat. When we solve this problem we will be able to save polar bears. In the meantime, there are programs that we could sponsor, to save polar bears. If this is accomplished they will be no need of asking, where are the polar bears!!? ?